Have you seen our WeAllSew boards on Pinterest? We’ve created fun boards to spark your imagination – from our creative and easy-to-sew WeAllSew projects to sewing tips and techniques, plus recycling, fun notions, favorite fabrics, awesome prints, sewing spaces, quilting trends, and much, much more. 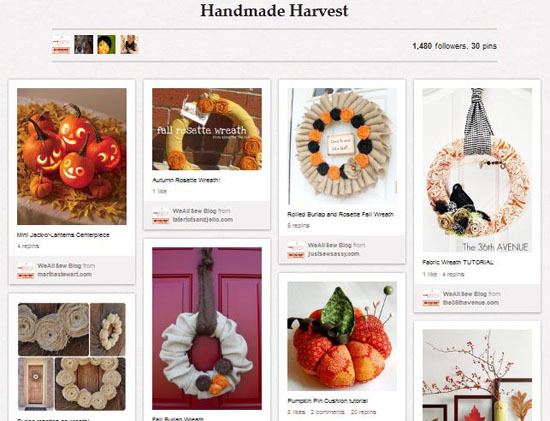 Our newly added “Handmade Harvest” board celebrates the upcoming season with a cornucopia of inspiring photos. We’ve pinned all things creative within the fall season, from wreathes to appliqué projects, elegant home décor to just-for-fun fall accessories. 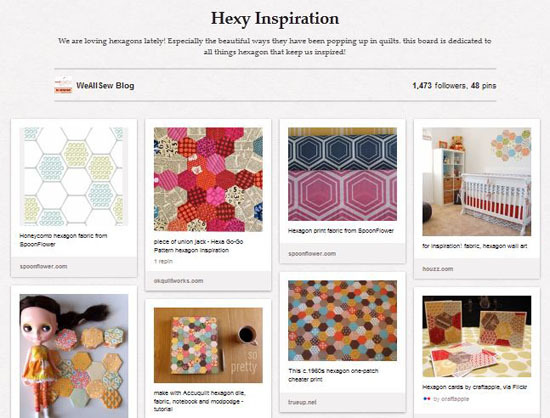 And, since we just love hexagons, we created the “Hexy Inspiration” board to share our latest obsession with you. Hexagons are the new chevron! We’ve found hexy projects in quilts and also in home décor, jewelry and art. We took this trend and made a board to share with you the many ways this shape can be applied. Caution: This board might put a “hex” on you, inspiring dreams of tessellated hexagons! If you are inspired by any of our WeAllSew.com posts and want to share images with your friends, simply click on the “Pin-it” button below the post and pin away. We’ll keep you posted on the fun boards we are continuously creating! Or visit us at Pinterest anytime to see what new inspiration we have in store for you. Previous Previous post: The Third and Final WeAllSew Challenge Starts Soon!